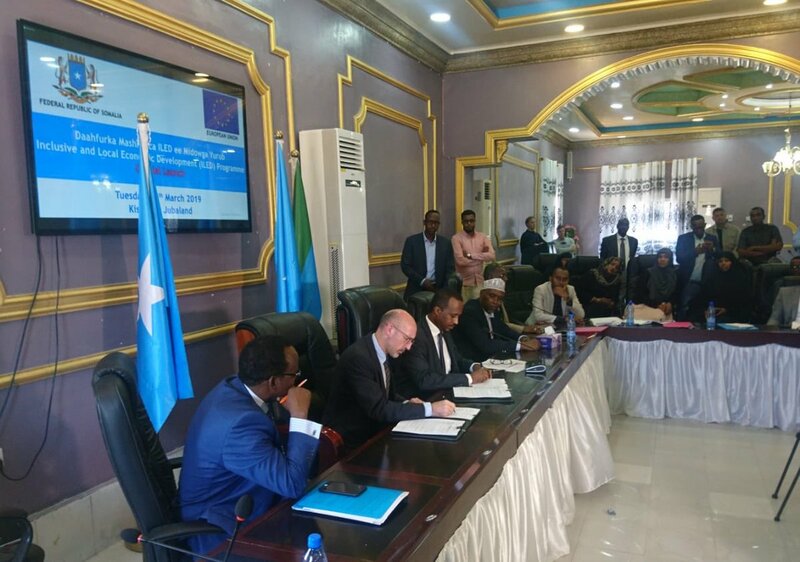 Kismayu, 12 March, The EU Delegation to the Federal Republic of Somalia jointly with the Federal Government of Somalia and the hosting Jubaland State government, today launched the Inclusive Local and Economic Development (ILED) Programme. The event was graced by President of Jubaland H.E. Ahmed Islam Madoobe, Federal Minster of Planning, H.E. Gamal M Hassan, EU Charge D' Affaires to Somalia Mr Fulgencio Garrido-Ruiz, Ministers of Planning from Federal Member States, international donors, implementing partners as well civil society organisations. ''This programme along with the recent Budget Support sets an important improvement in the EU partnership with Somalia and its strategy in the country, based on an increasing engagement with the national and local institutions and strong focus towards local implementation and service delivery.'' said EU Chargé d’Affaires, Fulgencio Garrido Ruiz during the launching event held in Kismayu.